The TIQView Blog shows using graph data in a business intelligence / business discovery solution like QlikView to do some more business related analytics. The result is an interactive QlikView analytics application where you can use a wide range of UI elements to discover relevant information from the graph. All of the code and samples are available here. 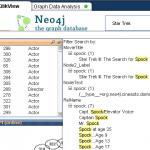 can we know more about this Graph Database in Qlikview extensions ?